India's online Microsoft store has been hacked, exposing the names, email addresses and passwords of its users, which were stored as plain text. 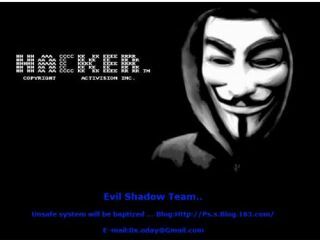 Chinese hackers Evil Shadow Team have taken credit for the hack, posting up a message saying: "Unsafe system will be baptized" and a link to the group's blog. Microsoft Store India is not run by Microsoft, but by an Indian company called Quasar Media. It appears that the Microsoft Store India stored user passwords as plain text, making it relatively easy for the hackers to get hold of sensitive information once they had gained access to the site. The information released included the email addresses, passwords and full names of site members, so if you happen to be one of them it would be a good idea to change your password immediately. The site's owners appear to have regained control, as the site now simply bears the message: "The Microsoft Store India is currently unavailable. Microsoft is working to restore access as quickly as possible. We apologize for any inconvenience this may have caused."